InterCasino, the popular Cryptologic powered online casino, is running a great promotion at the site that commenced on Wednesday, October 24 and will continue until Wednesday, 31, titled Frightmare Manor Promotion. Players wishing to participate in this promotion are required to choose one of three top floor horrifying offers that will automatically put them into the race. 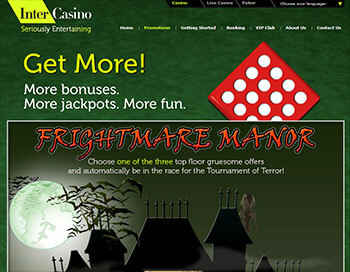 The first horrifying offer is the Frightmare Manor Deposit and players need to enter bonus code MANOR (which can be redeemed only once during the promotion) before making a minimum deposit of $20 to earn a minimum of 100 points wagering on the Frightmare Slots – Witches & Warlocks, Zone of the Zombies and Vampire Bat and qualify for a reward. One point will be earned for each $10 wagered on any Frightmare Slot. The final horrifying offer is Frightmare Manor Cash Back where players are required to deposit and wager a minimum of $25 on any Frightmare slots in order to receive 25% cash back on any losses they may incur. This cash back is capped at $50. Players are required to avail themselves of one of the three top floor offers in the Frightmare Manor promotion in order to qualify for the Tournament of Terrors and those wagering the most on the qualifying slots during the period of the promotion will receive the following prizes. First placed player will receive $350, 2nd $200, third $150, 4th to 6th placed $100 each and 7th to 12th placed $50 each. Those players in 13th to 20th place will win $25 each. InterCasino is licensed by the Lotteries and Gaming Authority of Malta.